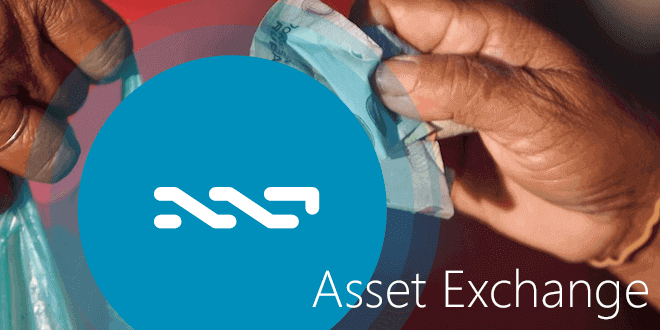 The Nxt Asset Exchange (AE) is Nxt’s built-in decentralized trading engine. Using the AE you can create, buy and sell assets that represent data beyond simple coin transfers – opening up wide-ranging possibilities. Also, you can pay dividends to your investors with a single click and only a 1 NXT fee, or you can transfer or burn any amount of assets if you need. The AE is based on the ‘coloured coins’ concept whereby a coin or a set of coins can be designated (‘coloured’) to represent something-else. By contrast, many crypto currencies only ever operate as just that – currencies, and nothing more. However, since the blockchain provides a trustworthy and permanent ledger of all transactions, it can be used to record far more diverse information than purely currency transactions. NXT was designed and built to leverage this coloured coins idea. NXT coins can be designated (‘coloured’) to represent other crypto coins, stocks/bonds, property, commodities, or even ideas. As a result, the NXT network can be used to trade almost anything. 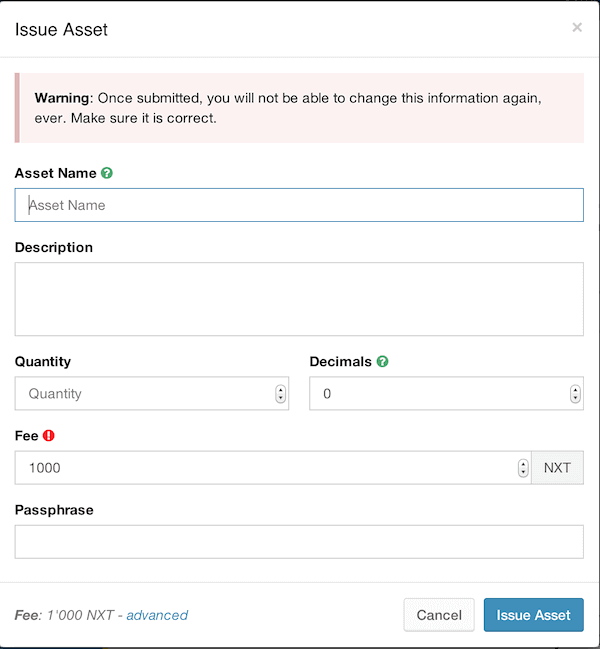 It currently costs 1,000 NXT to issue an asset, and just 1 NXT in transaction fees to buy or sell them. These crypto-assets can gain significant market cap, and many of them are listed on CoinMarketCap.com. In fact, since there are now so many, CMC has created a new page exclusively for assets, a high proportion of which (more than 70%) are, in fact, NXT assets. Many of these were launched by jl777, including SuperNET, NXTventure and InstantDEX. Others include Jinn and NXTTY. As well as trading on the AE against NXT, some of these assets can now be traded against BTC on the BTER and Poloniex exchanges. SecureAE.com – an online NXT wallet that puts the Asset Exchange at the centre of its functionality – also allows trading on the AE with Bitcoin. There are, of course, many different applications for assets, with hundreds already available. Here are just a few interesting use cases. At present, the most common use of the AE is to create and trade dividend-paying assets – effectively shares of revenue-generating companies. Issuing an asset is a popular way of raising money for a new project. For example, mining enterprises can raise capital to buy ASICs by issuing and selling assets. The mining rigs using the ASICs then generate income in the form of Bitcoin or other PoW coins, which is exchanged for NXT and paid out to asset holders as dividends every week. Coinomat’s USD asset is tied to the US dollar. The idea is that this can provide a degree of stability within a crypto-portfolio, without necessarily having to cash out by selling the assets and transferring the money to a bank account (with the costs, time and inconvenience which that would entail). It also means that you can send USD over national borders for just a 1 NXT fee. Using Coinomat’s service you can withdraw your USD assets to any VISA / Mastercard. Of course, the CoinoUSD asset’s utility/value depends on Coinomat honouring its promise to redeem it, and would be worthless if the company failed to do so; the concept therefore requires centralization to achieve its aims. You can read more in this article or on the NXT forum. Nxterpoints (NXTP) are reward points given to people who contribute to nxter.org. Every month, Nxter.org dividends out its net profit (generated by advertising, store sales and services fees) to all NXTP holders: writers, translators, editors, graphic designers, site developers etc. This means that any person who is having an influence on nxter.org’s net worth, gets monthly rewards in NXT through the asset exchange according to their contribution to the income. The dividends are transferred to their Nxt account for as long as they own the Nxterpoints, which can of course also be traded on the AE. You can read more about this groundbreaking reward concept here. Coin IPOs are commonplace in the crypto world, and after doing just a little research in the field you should realize that some of them are scams. It can’t be overstated that you must ALWAYS do your due diligence before investing in anything. Revenue sharing assets include BGCaffe, a South African café (with plans to expand), Lyth; an upcoming MMORPG based on Nxt features; FinHive (AI on the Nxt blockchain); Pangea, a decentralized poker game; Coinomat, an exchange accepting Nxt, Tradebots (NxtCoinsco) and a lot of revenue sharing mining assets. Company stocks (shares of the entire company) include examples like Jinn Labs (which is developing a general purpose processor based on ternary logic); SuperNET; Nxt Mobile Applications Company (the company behind the Nxtty mobile messaging app), and more. mgwBTC, for example, is a crypto backed Nxt asset representing Bitcoin. mgwBTC is used by Multigateway, the distributed cryptocoin exchange developed on top of Nxt by jl777. You simply transfer your Bitcoins (or LTC, BTCD and what other coins are supported) to an address generated by the multigateway, and these are automatically made tradeable in the MGW exchange and on Nxt AE. toknormal describes an example from the software development industry. – a licensing component in the software makes a call to the NXT network and creates an account (instantaneous). – it writes the private key to disk and informs the user of the account number. – the user purchases one license unit from the NXT asset exchange. – on a subsequent launch (or periodically) the software detects the presence of the appropriate asset in the account it created for itself and considers the installation licensed. Nxt is among the fastest cryptos with 1 minute block times, compared to Bitcoin’s 60 mins. To some though, even this may not be fast enough. Step forward InstantDEX: A Nxt 3rd party service, and now also a core service of the innovative SuperNET project, which aims to provide its users with nearly instant transactions. It’s also an asset which will dividend out a percentage of the commissions generated by the service; currently, it’s paying asset dividends to its investors from its holding of NXTventure. With the NXT AE, people are able to trade things, but there will be the blocktime to wait. 1 minute usually, but sometimes could be more. Also 1 minute will feel like a really long time if the market is changing dramatically. The goal of InstantDEX is to offer realtime trading of NXT, NXT assets and other cryptos. there won’t be any centralized servers, there won’t even be an actual website as the GUI will be running locally. Just direct peer to peer trading in realtime. The monetization model is very clear and simple. InstantDEX will not have any fees for withdrawals [or for changing a bid or ask] and the commissions will be set to 0.1% at first. The bottom line: research, research and research. If a long-standing member of the community with a proven track-record issues an asset, there is more reason for confidence than if a newcomer does – no matter how impressive their sales pitch. Ultimately, the responsibility to check out an asset, its issuer and business plan is yours. Nxt is a versatile, open source cryptocurrency platform. In this Nxt CORE article series we will dive into the main 2.0 features of Nxt. The first article was about NXT, the token itself, the second about Nxt ALIAS system, and the third about Nxt Arbitrary Messages. Upcoming: Nxt Marketplace (DGS), Nxt Monetary System (MS). The information contained in this article does not constitute (and is not intended to constitute) any form of advice, recommendation, representation, or endorsement by the author or the web site owner and should not be relied upon when making (or refraining from making) any investment decision.